As a rule, August – like January – is the month studios sweep out their bin of movies that weren’t quite good enough to make the prime time cut. Usually we can expect little more than dregs until mid-autumn, when both holiday and awards season begins in earnest and studios once again proudly populate cinemas. 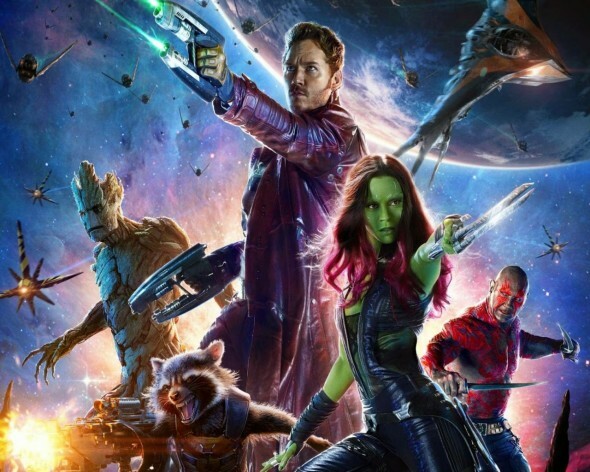 And yet, in what has been the summer of SciFi, James Gunn elevates our August with one of the most entertaining films of 2014, Marvel’s Guardians of the Galaxy. An uneasy bond connects five interstellar losers, each needing another to 1) avenge, 2) cash in, 3) survive, and 4) save the galaxy. It has to do with an orb, is all very cosmic bounty hunter-y, and includes a raccoon that sounds remarkably like 2011’s Sexiest Man Alive. Right there – casting Bradley Cooper as the raccoon – Gunn zigs when you expect him to zag. Cooper excels as the very angry varmint, joining an entirely inspired cast. Chris Pratt, who beefcaked up a bit for the gig, shoulders the leading role in his second relentlessly enjoyable film this year, after January’s joyous The Lego Movie, here playing the American intergalactic scavenger and adventurer, and lover of easy listening jams. Pratt’s endearing combination of humility and confidence charms, and with a casual goofiness he elevates every line of the admittedly clever dialog, all of it brimming with crisp pop culture humor made funnier by the context (in that no one but Pratt’s Peter Quill could possibly get the earth references). He makes a hero of Kevin Bacon in his dramatic retelling of Footloose, which only gets funnier from Zoe Saldana’s callback in the final act. Saldana joins WWE’s Dave Bautista and the voice of Vin Diesel (as a tree) to fill out Peter Quill’s band of misfits, and together the crew offers endless amounts of ruffian charm. As important, all evil doers – from Lee Pace’s zealot Ronan to Benicio del Toro’s creepy Collector to Michael Rooker’s dangerous Yondu – are delightfully diabolical. Gunn nicely articulates the galaxy and its characters, keeps the humor light, the action quick and the palette colorful.